Plunging headlong into another new year, I’m not a resolution maker. That’s because I learned a long time ago that I’m not a resolution keeper. What the New Year does do for me, though, is make me take stock of my life. I recognize what I have done well and what I could have done better. To my way of thinking, as long as the good outweighs the bad I’m doing all right. Of course, there’s always room for improvement. Now it’s time to make up for my “sins”. The over indulgence of the holiday season is showing, especially in my waist line. I’ll try to eat a little better, but that won’t last long. I like to cook too much, and bacon and butter jump out of my fridge too often. One of my holiday splurges was a very large Beef Tenderloin. I used a new cooking method suggested by Cook’s Illustrated. 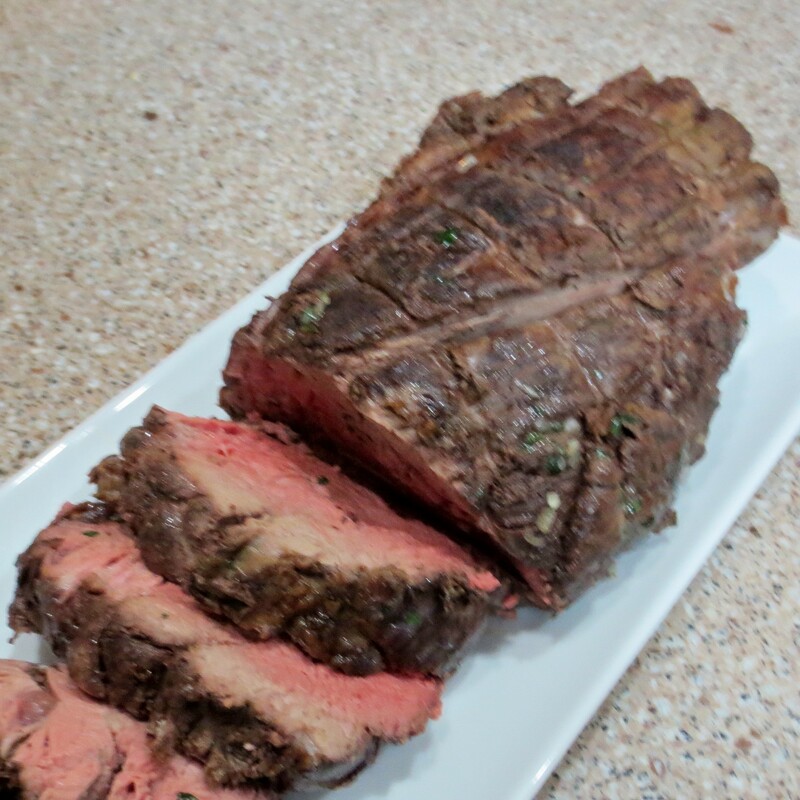 The roast is cooked low and slow, then seared over high heat at the end. This tenderloin turned out perfectly. I purchased the tenderloin untrimmed and did it myself. That cut of meat is too expensive to waste one bit on the fast trim job the butchers do. The trimmings went into another pot to make True Au Jus. We savored every morsel. I used my newest toy, a deli-style meat slicer, to slice the leftovers to just the right thickness for Redneck Cheesesteak Subs. The last of the au jus was finished off in French dip sandwiches. 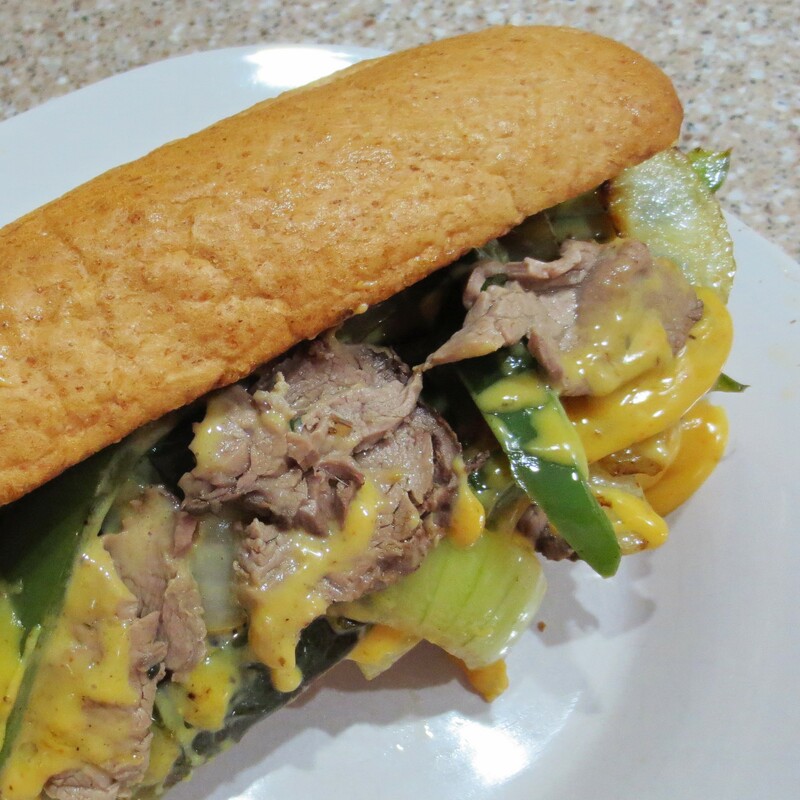 We just piled sliced tenderloin onto hoagie rolls and dunked away. New Years Eve was celebrated a little differently this year. We watched Alabama win in the Cotton Bowl. Football games require their own set of football food, none of which is diet friendly. Michael always has his special pizza and I usually enjoy some sort of deli sandwich, but the best part of football food is the snack food. It’s both amazing and sinful that we manage to devour so much of it. Spicy Sausage Balls are always on the table, along with a bowl of Bold Party Mix and Slice and Bake Cheese Crackers. 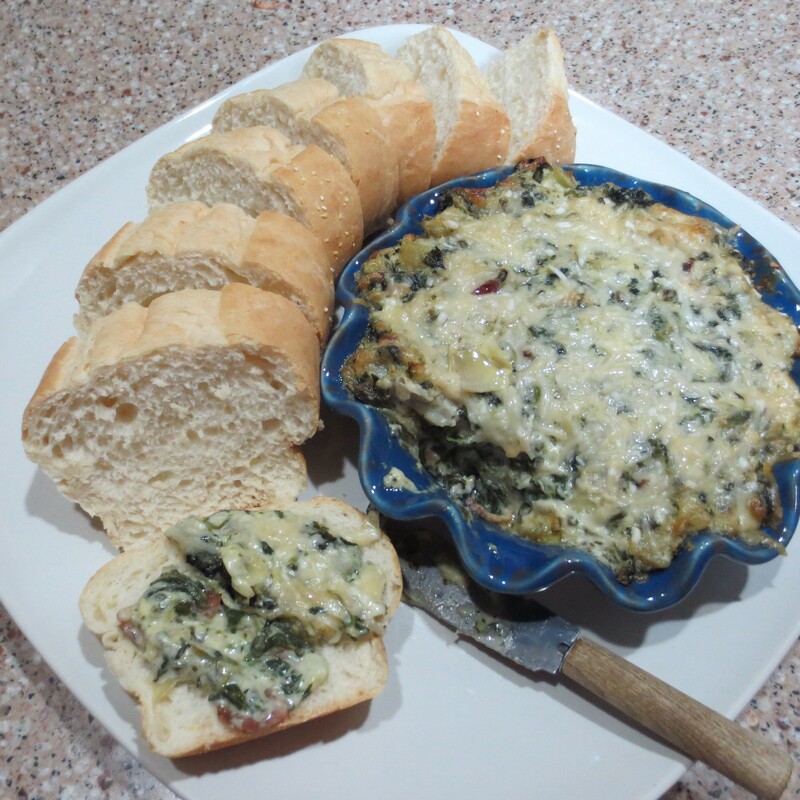 My favorite this time was warm and cheesy Spinach and Artichoke Spread. Is it any wonder I’m having a hard time buttoning my jeans? New Years day it was time to start paying the piper, and we didn’t do too badly. 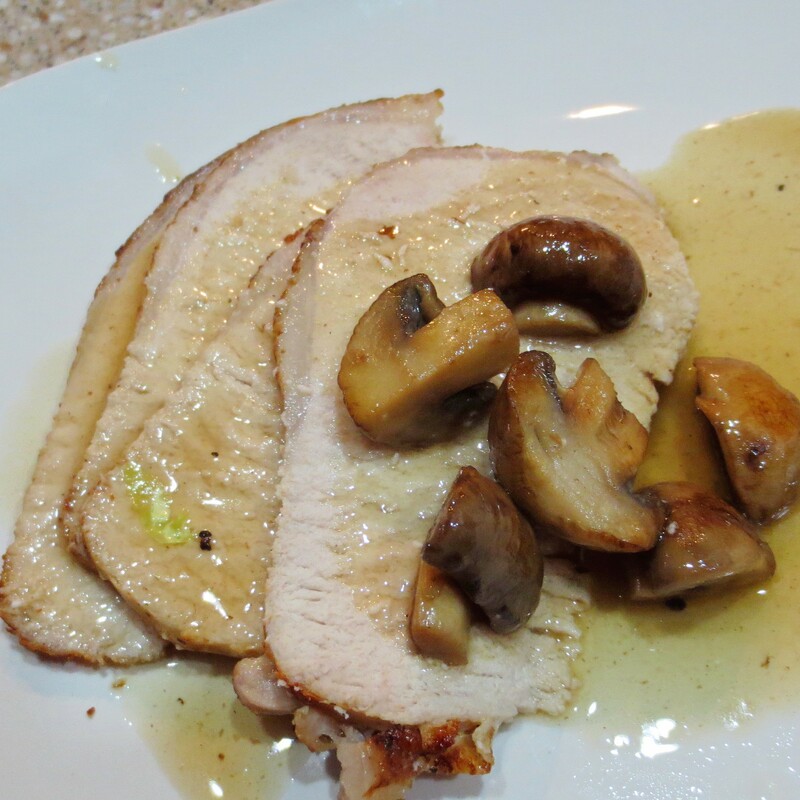 Sunday Pork Roast has a whole lot of flavor, but not too many calories. Pink Eyed Peas (for luck) and simple boiled cabbage (for money) are pretty good for the diet, too. We even skipped the dessert! I’m getting tired of leftovers, no matter how I disguise them. It’s time to move on. There’s no telling what I might come up with in the coming week, but I’ll try to keep the bacon and the butter in their place. This entry was posted in Uncategorized on January 3, 2016 by lizziesmom2012.